The European Conference of Postal and Telecommunications Administrations (CEPT) was established on June 26, 1959, as a coordinating body for European state telecommunications and postal organizations. The acronym comes from the French version of its name Conférence européenne des administrations des postes et des télécommunications. CEPT was responsible for the creation of the European Telecommunications Standards Institute (ETSI) in 1988. 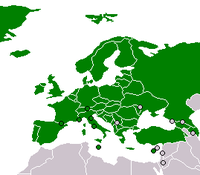 As of October 2007: 48 countries. ↑ ECC - Who we are. Cept.org (2011-07-01). Retrieved on 2014-03-12.